The Highlead GC20698-1-D FL2 is a single needle long arm flatbed walking foot sewing machine with automatic thread trimmer and electronic needle position control. The long sewing machine arm allows up-to 635mm* clearance to the right of the needle, which is around 2.5 times bigger than a standard machine arm. 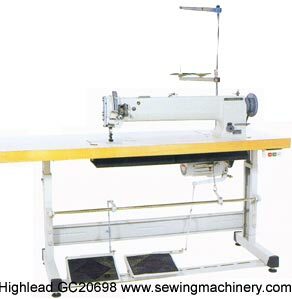 The Highlead GC20698-1-D FL2 is a feature packed long arm machine and as well as compound feed (bottom feed, needle feed & walking foot) and automatic thread trimming, it comes as standard with programmable auto back-tack, auto reverse, knuckle quick reverse and built in stitch program module. An optional air operated automatic foot lifter is also available. The Highlead GC20698-1-D FL2 is a long arm, single needle, needle feed, walking foot machine with UBT, for use on medium to heavy weight materials and is aimed at job applications where a standard arm sewing machine is not suitable. Large covers, upholstery panels, car trimmings, inflatable products, bouncy castles, awnings, tents, parachutes, gliders, hot air balloons, sails, lorry curtain sidings, top stitching leather etc., + many other large items..